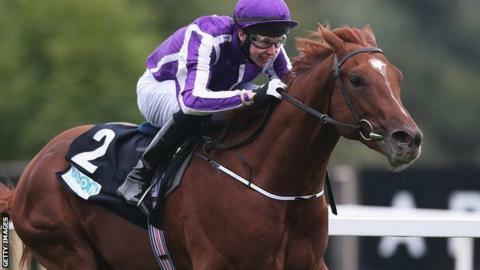 Irish champion trainer Aidan O'Brien says his Derby favourite Australia is "a step up" from his four previous winners of the Epsom Classic. The colt, a son of 2001 Derby winner Galileo and 2004 Oaks victor Ouija Board, was third in the 2,000 Guineas at Newmarket. "He's a Derby horse like we've never had before, that's the reality," said the trainer ahead of the 7 June race. Meanwhile, Kingston Hill - trained by Roger Varian, goes straight to Epsom. Last season's Racing Post Trophy winner, about 12-1 third favourite behind market leader Australia for the Derby, will miss the Dante Stakes at York on Thursday. "Kingston Hill is perfectly well. I have taken a lot of encouragement from his run at Newmarket [eighth in the Guineas] and we will now head straight to the Derby," said Varian. As for Australia, O'Brien said the horse had a minor bug about two months before the Guineas. The 44-year-old hopes to run four horses in the Derby, including Orchestra, Geoffrey Chaucer and Kingfisher, but struggled to rein in his enthusiasm about the 11-8 Derby favourite during a media trip to his Ballydoyle yard in County Tipperary. O'Brien, who has trained equine stars such as triple champion hurdler Istabraq and serial Group One winner Rock Of Gibraltar, said: "We've never had a horse like this." Australia was third to 40-1 shot Night of Thunder in the one-mile Guineas, but his pedigree suggests the further half mile at Epsom would suit him better. "If you ask me if he is going to stay, you can never say that until you run him. All the genetics suggest he would have no problem with it," said O'Brien. When reminded that two years ago he suggested Camelot - a Guineas and Derby winner before finishing a narrow second when going for the Triple Crown in the St Leger - was the best he had trained, O'Brien replied: "Camelot was, I thought, the best we've had. "Try to put it some way so I won't get slated but this horse is another step up." O'Brien said he had made a mistake running Camelot in the 2012 Irish Derby, which he won on very soft ground. "It broke his heart," he said of the horse, who only won one of his five subsequent races. The trainer's 2013 Epsom winner Ruler Of The World is likely to return to the Surrey track on Derby Day for the Investec Coronation Cup.